Compared to the new norm of high horsepower figures, over-complicated driving modes and part-electric drivetrains, there’s a refreshing purity to the latest MX-5. Not that it’s low-tech, but that the engineering was incredibly tightly focused on extracting every gram of performance from its components before stretching its taut metalwork over the top. When you consider the roadster, launched to critical acclaim back in 2015, even has a manual folding roof to reduce weight, this second bodystyle seems a bit of a U-turn. Reckoning that soft-top motoring doesn’t appeal to everyone, the RF (Retractable Fastback) features a three-piece electrically-folding roof, with a centre section and rear window that disappear into the boot. The aim is refinement closer to a coupe, but without losing the ability for some al-fresco motoring when the weather allows. 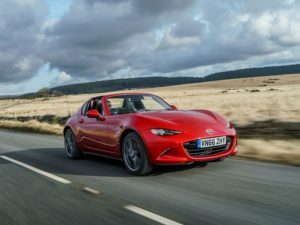 Arguably – considering how pretty the RF looks with its roof in place – it’s a missed opportunity to turn the MX-5 into the purest of pure driver’s cars, and build a proper fastback without the weight and rigidity compromises of an open top. 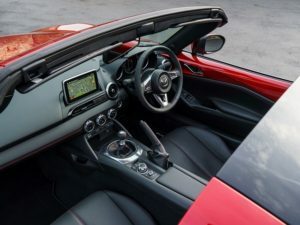 But Mazda has worked hard not to compromise the roadster’s agility; there’s only a 45kg weight compromise compared to the roadster (40kg on 1.5-litre versions), the 50:50 front:rear weight distribution is unaffected, the suspension re-tuned, and the mechanism itself is compact enough not to spoil those taut bodylines. You’d be hard pressed to say it’s taken any of the roadster’s magic away. The RF weighs only slightly more than a Mazda2, and with its short overhangs, wide tracks, precise, perfectly-weighted steering and peerless, short-throw six-speed gearbox, it’s a car that wraps you in the driving experience without needing to risk licence or limb. A reminder that hundreds of horsepower really isn’t necessary if the car underneath is this well set up. Better yet, there’s no poor relation here; the 1.5-litre delivers very one of its 131hp with surprising gusto, right at the top of the rev range, while the 160hp 2.0-litre tested here offers similar rewards for holding gear, but with a broader spread of pulling power and better long-distance ability. Neither will leave you feeling short-changed, though it’s worth noting that it’s only the latter that gets the limited-slip differential, bracing across the front shock towers, and (in Sport Nav guise) uprated Bilstein dampers. It’s just that little bit more direct as a result. But it’s not quite as accessible as the roadster. The RF adds £1,800 to the equivalent soft-top, but as there’s no SE spec, there’s almost a £4,000 difference in entry-level pricing. It’s well equipped, with DAB, Bluetooth and Mazda’s not overly intuitive internet-connected navigation system included as standard, while Sport Nav includes Bose audio with speakers in the headrests. However, as in the coupe, the driving position is tailored to average-height drivers, there’s very hardly any headroom and the steering wheel isn’t reach-adjustable. And that compact electric motor means the roof only opens and closes at 6mph or less. 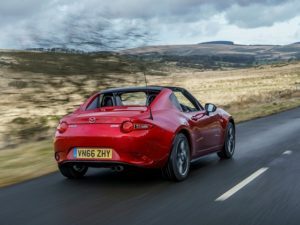 So yes, the RF sacrifices a little of the MX-5’s simplicity in the name of refinement, but not enough to compromise the low-speed driver thrills of its soft-top sibling. If anything, it’s an even better fit for British tastes than the roadster. Mazda re-invigorated the lightweight roadster concept with the first MX-5, and it hasn’t blunted that with the RF. This feels like one of the last in a dying breed; enjoy it while you can.